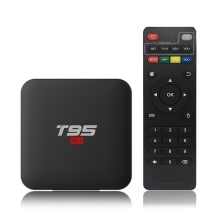 T95 S1 Smart Android TV Box is your great choice and can change your traditional TV & LCD monitor into a multimedia center by connecting the Internet (Via WiFi or RJ45). This smart Android TV Box will bring you much fun and convenience with its powerful feature: Android 7.1, Amlogic S905W Quad-Core CPU, Mali-450 GPU, 2GB RAM and 16GB ROM, H.265 video hardware decoding, 2.4G WiFi, 100M LAN connection, LED Display and 2.4G voice remote control. T95 S1 runs on Android 7.1 System, perfect in productivity, stability and performance, along with various of features and optimizations. Powered by Amlogic S905W Quad core ARM Cortex-A53 CPU, T95 S1 is a HD media player with Mali-450 penta-core, up to 750MHz GPU. It boasts 2GB RAM and 16GB ROM, supporting TF Card Reading up to 32GB, giving you more space to store media files and to run the device smoothly. H.265 hardware decoding, powerful decoding capabilities, can decode most of the file formats at present, and save about 50% bandwidth. Press the voice button on the remote control to search for what you want, such as the best action movies, today&apos;s weather or the latest news. Note: Remote control is powered by 2 AAA batteries (not included).